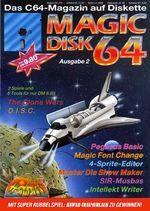 The "Magic Disk 64" was a purely German-speaking disk magazine for the Commodore 64, that was released by the CP Verlag (Computer Publications GmbH) from 12/1987 (27.11.1987) to 11/1993 independently. The 5,25" program disk was wrapped inside a corresponding "Magic Disk 64" envelope with a cardboard and was sold nationwide at the kiosk. It offered a mixture of different programs as games, applications and ultilities, which could be started directly from the menu system. In the menu system also the complete software was explained, as well as programming courses, game tests, letter to the editor (answered by Uncle Paul Plodder) and news were covered. To keep the reading of the texts from being too boring, a new background music played every month (from 08/1989). The electronic magazin articles could also be printed. In 1988 a special edition of the "Magic Disk 64", the C64 disk magazine "Golden Disk 64" was published. 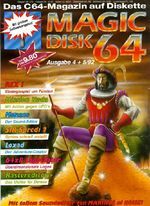 In the 90s the special editions of the "Magic Disk 64" under the name "Gold Edition". The issues 09 and 10/1989 were provided with a copy protection that caused some problems. Through this method (and others) it was not allowed to validate the magazine disk! With the issue 12/1993 the "Magic Disk 64" was laid together with the disk magazine "Game On" and together with the computer magazine "Play Time" bundled as "C64 Three in One Kombi", i.e. there were 2 disks and one game magazine for different systems for one price. 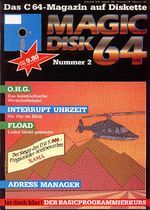 The mere disk magazine "Magic Disk 64" was ceased with issue 07/1995. After that the publisher tried to publish a C64 magazine with disk under the name "Magic Disk Classic 64". Here the monthly issues 08/1995 to 01/1996 were released. 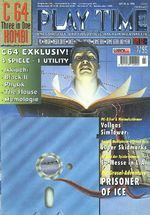 At the beginning of 1996 the Magna Media Verlag bought the C64 software pool of the CP Verlags - which is the "Magic Disk 64" and the "Game On" - and integrated it into its computer magazine "64'er" (from 02/1996). Hardware clock for the 64! Is the operation of US modems now exempt from punishment? Starting from this issue the Professor (Paul) Plodder answers to the letters to the editor. 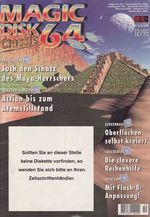 Issue 03/1994 in the "C64 Three in One Kombi"
Ausgabe 04/1994 im "C64 Three in One Kombi"
'*Shifting of the release numbers of the Play Time or the "C64 Three in One Kombi" to the release number of the Magic Disk 64 and the Game On due to different summer breaks of the single editorial staff possible !! "Gold Edition - The best games and tools"
This page was last modified on 25 February 2015, at 05:45.